You can download Gomez Peer Zone -a completely free automated money making software and install it on you PC computer. It will run in the background and bring money for you while browsing the internet. Gomez Peer Zone is an affiliated with their parent company Compuware Gomez. Compuware Gomez is an established coGomez Peer zone review parent companympany that has been around for over a decade. Gomez Peer Zone has not been around for that long, but is also a well established company that I highly recommend. Yes, you needn’t to do anything. Of course, there’s no such thing as a free lunch. Actually this company use your leisure CPU for their Performance Test and they will pay you a little money for this. Once you install their free software, it will run in the background. So the truth is you make money with your own computer. Maybe you are a kind of disappointed. It is better than nothing. After all, you can make this without doing anything, just running in the background. Increasing your machine’s workload increases the amount of time your computer will spend processing work earning you higher monthly payments. Add more PCs to your PEER account. Verify your preferences on the PEER user interface. To be eligible for online time and work processed payments, the characteristics (country, zip/postal code, Internet connection type) you indicate on the PEER preferences window must match the actual characteristics of your PC. Check your screen saver and energy saver settings. Gomez Peer Zone software can only be installed on PC. Gomez PEER is available for Windows XP/2003/Vista/2008 and Windows 7 (x64 platforms are also supported). Linux, Mac and Solaris are not supported. PayPal is currently the only ways to receive payment for running the PEER application. You must have an active PayPal account by the payment date or you will forfeit that month’s earnings. 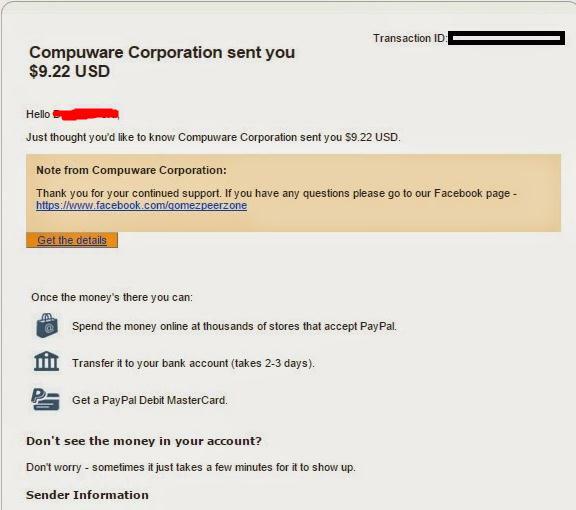 If your income don’t reach this, it will roll in next month and up to $5, then you can get it from your Paypal account. This payment procession is automatic. about 10-15 business days from the earnings close date (the last calendar of the month) for payment to appear in your PayPal account. How to apply for and download Gomez Peer Zone? The e-mail address you register with your Gomez account MUST be the same e-mail address on file for your PayPal account. If the e-mail address differs between the accounts you payment will not be processed.